In Slovenia, the number of ISO 14001 certified companies and companies registered under the EMAS standard, as well as the number of awarded eco-label flowers, has been increasing. Slovenia ranks above the EU-27 average in the number of awarded ISO 14001 certificates and eco-label flowers. 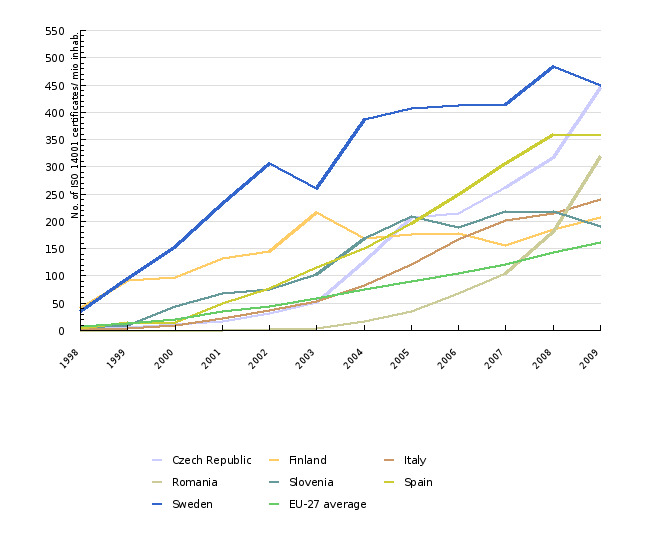 Slovenia has been less successful with the EMAS standard – here, it is among the lowest ranked EU-27 countries. 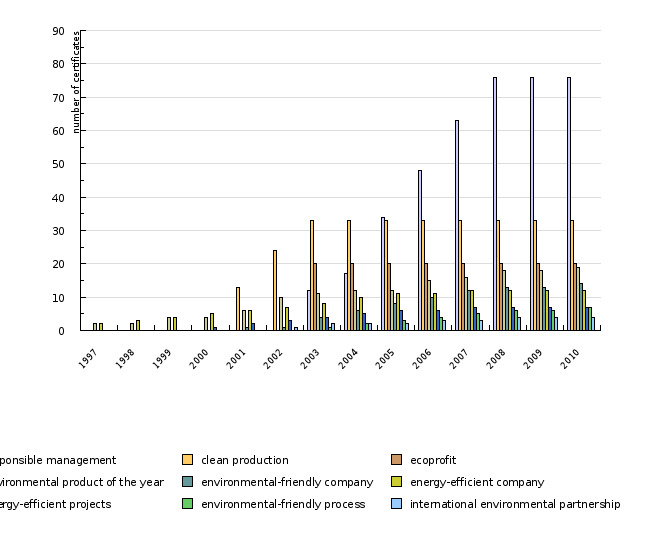 This indicator shows the development of environmental management systems. It presents the development in the number of awarded environmental certificates under the ISO 14001 standard and the EMAS scheme as well as the development in the number of awarded eco-label flowers in Slovenia and the EU. For easier perception and comparison with EU countries, the data on environmental certificates and labels is expressed per million inhabitants. In addition to the aforementioned mechanisms for encouraging environmental management, the indicator also shows the development in the number of awarded environmental certificates for energy efficient companies, energy efficient projects, clean production, environmentally friendly companies, environmental product of the year, international environmental partnerships, eco-profit, environmentally responsible performance and environmentally friendly procedures. ISO 14001 is an internationally agreed standard that sets out the requirements for an environmental management system. It helps organizations improve their environmental performance through pollution prevention and more efficient use of resources. The EU Eco-Management and Audit Scheme (EMAS) for the environmental management of organisations is an environmental management system that was introduced in 1995. Organisations that have been awarded EMAS certificates are obliged to continuously assess and improve their environmental performance and inform the public of the environmental impact of their activities. EMAS is an upgrade of the ISO 14001 standard. It ensures greater openness, transparency and periodical publication of verified environmental information. Compared to the ISO 14001, the EMAS has higher demands with regard to improved performance, participation of employees, legal compliance and communication with the public. The Eco-label flower is an instrument of environmental protection. The EU introduced it in 1992 in order to encourage companies to develop products and services that maximally reduce environmental impact throughout the product/service life cycle and provide consumers with better information on the environmental impact of their products/services. The overall impact of products is assessed – from the extraction of raw materials to the disposal of used products, while consumers are directed through the provision of accurate, clear and scientifically supported information on products and services. The advantages of being awarded the Eco-label flower include confirmation of meeting environmental requirements, use of the Eco-label and, last but not least, promotion. The scheme supports all products except food, beverages, pharmaceuticals and medical devices, but changes or enhancements are being prepared in these fields as well. The introduction of environmental management systems represents an important economic instrument for communication and harmonisation in the field of environmental protection. For companies, it represents an internationally recognised approach to management that covers all the most important aspects of environmental management (from the use of raw materials and energy, to management of technological processes and requirements relating to the use of products) and leads to elimination and reduction of adverse impacts on the environment. The advantage of introducing an environmental management system is represented by compliance with environmental legislation and reduction of costs as well as an increased competitiveness in marketing products, technologies and knowledge on international markets and expanding the market of a company’s business operation. It belongs among voluntary approaches that usually establish themselves in the business sector through public programmes. EU-27 average no. of Ecolabels/ mio inhab. Environmental certificates such as the ISO 14001 standard and the EMAS are among important instruments of the Sustainable Production and Consumption and Sustainable Industrial Policy Action Plan. The goal of their introduction is to encourage continuous improvement in order to increase environmental performance of organisations. A special emphasis of the EMAS is systemic, objective and regular performance assessment and making available information on environmental performance to the public and other interested parties as well as education and inclusion of employees in active participation in the scheme (EMAS Regulation). The EU goal through awarding the Eco-label flower is to introduce a voluntary system aimed at promoting products that have low environmental impacts throughout their life cycle and providing consumers with accurate, clear and scientifically supported information on the impact of products on the environment. The latter results in the substitution of hazardous substances with safer ones where technically feasible (Eco-Label Regulation). The number of companies registered in accordance with the ISO 14001 standard and the EMAS is growing in Slovenia as well as in the EU-27. Slovenia is among the top EU countries regarding the number of awarded ISO 14001 certificates. In 2011, 202 organisations with ISO 14001 certificates per million inhabitants were registered in Slovenia, while the EU-27 average is 198 organisations per million inhabitants. Sweden (430) and the Czech Republic (424) have the highest number of organisations registered in accordance with the ISO 14001 standard per million inhabitants. Compared to the ISO 14001 standard, the number of Slovenian organisations included in the EMAS is rather modest. In Europe, the highest numbers of organisations registered under the EMAS per million inhabitants in 2011 were recorded in Austria (33), Spain (26), Italy (18), Germany (17) and Denmark (17). On average in 2011, there were 9 organisations with one or more EMAS certificates per million inhabitants per country in the EU-27. 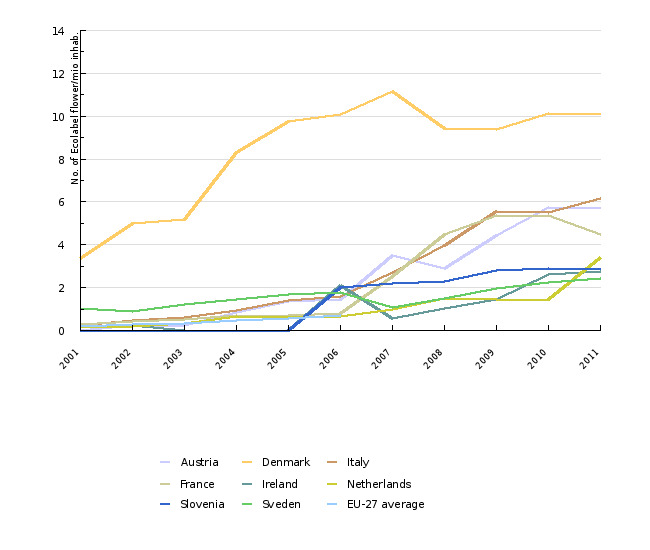 With three EMAS certificates awarded by the end of 2011, Slovenia is ranked in the lower half of the EU-27 countries. Due to great efforts of the European Commission, particularly in terms of introduction of integrated approaches to environmental management and integration of environmental issues in sectoral policies, a rapid increase in the number of environmental management system, the EMAS in particular, is to be expected in the future. The latter is pointed out as a strategic goal of the Resolution on the National Environmental Action Programme for the Period 2005–2012, which emphasises the importance of EMAS certificates in the public sector (municipal administrations, providers of environmental protection public services). 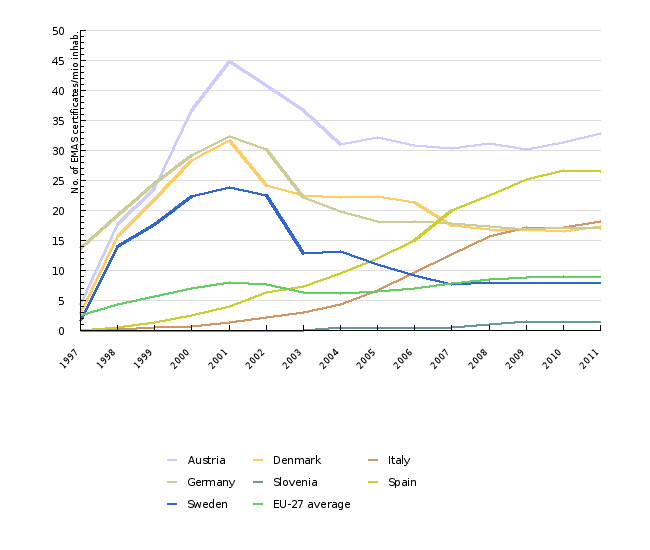 Since 1992, when the Eco-label flower was introduced in the EU, the number of companies awarded the Eco-label has been rapidly increasing. In 2011, 1,150 Eco-labels were awarded in the EU-27, the largest numbers being in Italy (6.2/million inhabitants) and France (3.9/million inhabitants). The EU Eco-label is awarded for 24 types of products and services, with new categories being added constantly. In 2011, as many as 36% of all awarded Eco-labels were awarded for tourist accommodation services. In Slovenia, 7 Eco-labels were awarded in 2011, which ranks Slovenia above the EU-27 average. The labels awarded so far fall into the categories of copying and graphic papers, soaps, shampoos and balms, universal cleaning agents and detergents (6). Two were awarded for tourist accommodation and one for interior dyes and varnishes. In addition to the ISO 14001 standard and the EMAS, other environmental policy instruments exist in Slovenia, including environmental certificates. In 2012, the largest number of certificates was awarded to responsible care programmes (118), followed by clean production (33) and environmental product of the year (21). These programmes are aimed at prevention or reduction of pollution, efficient energy use and concurrent achievement of positive economic results through improved production process technologies, products and services. The responsible care programme is a covenant of the global chemical industry. It emphasises the importance of human health protection and occupational safety. In addition to ISO 14001 systems and the EMAS scheme, other environmental policy instruments also exist in Slovenia. Figure IP01-3 shows the number of awarded environmental certificates. The most certificates have been awarded in the field of clean production, eco-profit and responsible care. Through production processes, products and services, the awarded programmes are aimed at prevention or reduction of pollution, higher energy efficiency and, simultaneous, achievement of positive economic results. The responsible care programme is an initiative of the global chemical industry. It emphasises the importance of health protection and occupational safety. Until 2006 (inclusive), 33 Slovenian companies were included in the clean production programme, 20 in the eco-profit programme and 35 in the responsible care programme.